Posted on September 17, 2017 by smilewordpress Leave a Comment on Hello world! Monerator Portable Generator 128 Wh, 10000 mAh, 140 W, LiFePO4 Battery Backup without solar panel. 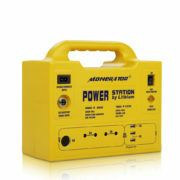 Monerator Portable Generator 256 Wh, 20000 mAh, 140 W, LiFePO4 Battery Backup without solar panel.